“Team Andy”: I've been privileged to have been a member of the Credit Unions Kids @ Heart Team since the 2000 Boston Marathon, when I was fortunate enough to be teamed up with my original Patient Partner, Andy Martin for the first time. 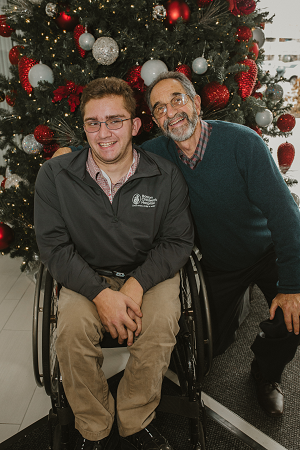 After 14 consecutive Boston Marathons as my Patient Partner, Andy achieved a goal that he had since he was just 4 years old, by completing the 2014 Boston Marathon as a wheelchair entrant in his first year of eligibility (age 18). Andy followed this up by completing the 2015, 2017, and 2018 Boston Marathons. We are all very inspired by Andy's determination and proud of his accomplishments. As Andy is currently in recovery from surgery, he will be taking some time off from his marathon career and so Andy once again will be my Patient Partner for the 2019 Boston Marathon. This will be the 20th time that Andy has been either my Teammate or Patient Partner, so we are looking upon this as a milestone marathon. Boston Children's Hospital: I've been involved with the Credit Unions Kids @ Heart and Miles for Miracles programs for past 19 years because I believe so strongly in all the amazing things Boston Children’s Hospital does for kids. Without Boston Children's Hospital, many of these rare diseases would not get the appropriate attention they need. Today, Boston Children's Hospital is one of the only hospitals in the world with full clinical programs devoted to rare illnesses. The hospital's patient care programs are unusually sensitive to what sick and injured children and their families really need. Researchers regularly make amazing discoveries that change children's lives. Boston Children's welcomes kids whose families can't afford health care, more than any other hospital in Massachusetts. Community programs make a point of reaching out to help low-income and at-risk kids. And the hospital doesn't just stop there. Boston Children's really understands the importance of training the next generation of top pediatricians and nurses, so they can continue to provide the best, most innovative care possible to kids. Credit Union Kids @ Heart: This year, with 22 marathon entrants, the Credit Unions Kids @ Heart Team is attempting to raise $500,000 for Boston Children’s Hospital to be earmarked for several pediatric brain research projects, including the search for treatments, therapies, and cures for Moyamoya Disease, Sturge-Weber Syndrome, Cerebral Palsy, and Pediatric Brain Tumors. This important neurological research benefits pediatric hospitals and other care centers around the world. Not surprisingly, this research is being performed by the scientists at the leading pediatric hospital on the planet, Boston Children’s Hospital. P.S. We are all very inspired by Andy Martin’s determination and proud of his accomplishments. More about the history of “The Team Andy Project” can be found at: https://theteamandyproject.wordpress.com/ .